Operating in the VHF maritime band, the AIS system enables the wireless exchange of navigation status between vessels and shore-side traffic monitoring centers. Commercial ships, ocean-going vessels and recreational boats equipped with AIS transceivers broadcast AIS messages that include the vessel’s name, course, speed and current navigation status. Raymarine’s AIS350 is a receive-only AIS device that allows you to receive and display the AIS data transmissions from nearby vessels right on your Raymarine multifunction display’s radar or chartplotter screen. Raymarine’s new AIS350 Automatic Identification (AIS) receiver brings boaters best-in-class features and performance in a package that’s 50% smaller than previous generation AIS receivers. The new AIS350 is engineered for seamless integration with Raymarine multifunction displays and offers multiple connection options including SeaTalkng, NMEA2000, NMEA0183 and USB. This unprecedented flexibility makes the AIS350 easy to integrate with all of your onboard electronics including MFD’s, instruments, PC based navigation systems and more. 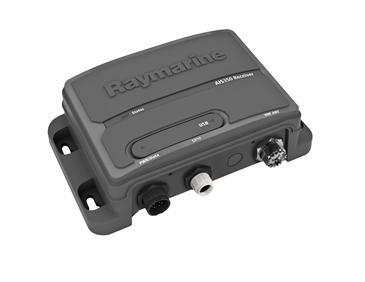 The Raymarine AIS350 features a dual-channel receiver system for fast acquisition and tracking of both Class A and Class B AIS targets. The targets can be displayed on any AIS compatible chartplotter or radar display including all Raymarine A-Series, C-Series Widescreen, E-Series Widescreen and G-Series systems. When used with Raymarine multifunction displays, the Raymarine AIS350 supports Raymarine’s exclusive Buddy Tracking feature, which allows you to save AIS targets of interest with a special icon and “friendly” name. Buddy tracking makes it easy to spot the boats of friends and family out on the water, or to identify other vessels-of-interest with ease. Raymarine AIS350 is also an excellent choice for coastal ship-spotting enthusiasts, harbormasters, and other users needing an easy-to-install, and highly reliable AIS receiver for use with a PC-based navigation or vessel tracking system. AIS350’s standard USB 2.0 (Universal Serial Bus) connection makes for 1-step plug and play integration with laptop and desktop computers. AIS350’s dual channel receiver architecture rapidly acquires both Class A and Class B targets and continues to update them more rapidly than previous generation receive-only units. This is particularly important when tracking fast-moving Class B vessels like speedboats, small commercial powerboats, and small fast ferries. The Raymarine AIS350 AIS Receiver is the natural choice for owners of Raymarine multifunction display products looking to increase their safety and situational awareness with AIS technology. The Raymarine AIS350 is engineered for simple installation and seamless integration with Raymarine multifunction display systems. As an integral part of any vessels multifunction navigation display system, the AIS350 is backed by the same superior service and support network as the multifunction displays themselves. Owners can also have peace of mind with the AIS350’s standard 2-year warranty, which is upgradeable to 3-years of coverage simply by registering the product online at www.raymarine.com. Dual channel receivers – AIS vessel monitoring of class A and B transmissions. SeaTalkng networking for simple integration with Raymarine C-Series Widescreen, E-Series Widescreen and G-Series systems. USB 2.0 port for plug-and-play connection to PC based navigation systems. Built-in NMEA multiplexer simplifies integration with legacy MFD display, VHF radios and 3rd party devices. Front-facing multicolor LED indicator for system status and diagnostics. Rugged, water resistant enclosure designed for easy below deck installation. LEN 1 Refer to SeaTalkng reference manual for further information.